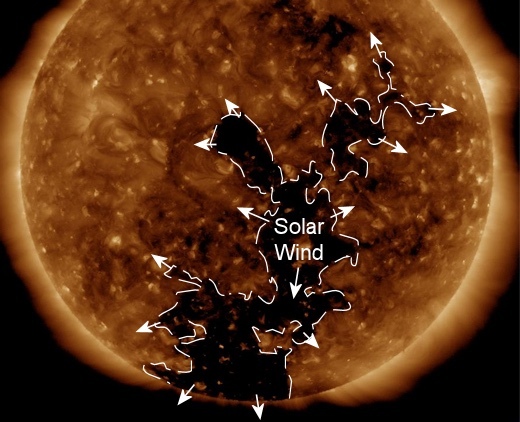 A complex network of coronal holes opened in a sunny atmosphere, and it spewed the solar wind into space. NASA’s Solar Dynamics Observatory (SDO) published a snapshot of a group of “dips” in a magnetic field that is currently facing the Earth. Coronal hole is the area where the solar magnetic field opens, allowing the solar wind to flow into space. According to the forecasts of the National Oceanic and Atmospheric Administration (NOAA), there is a 55 percent probability of occurrence of geomagnetic storms of G1 class, when gaseous material reaches our planet. This may happen on Thursday, March 22. The approaching flow of the solar wind will arrive immediately after the onset of spring in the Northern Hemisphere. With the opening of the “equinox fissures” in the Earth’s magnetic field, the solar wind is likely to penetrate into the protective layer of our planet and will cause bright radiance in the Arctic Circle.